Advances in microbiome science cast light on traditional concepts on nutritional science, and are poised for clinical translation. Epidemiologic observations which linked lifestyle factors to risk of disease are being re-interpreted with mechanistic insight based on improved understanding of the microbiota. Examples include the role of dietary fibre in disease prevention, the deleterious effects of highly restricted diets, and the contribution of the microbiota to over- and undernutrition. While the microbiota transduces nutrient signals for the host, food and habitual diet shape the composition of the gut microbiota at every stage of life. The composition and diversity of food intake determines which microbes will colonise, flourish, persist, or become extinct. Disruption of the developing microbiota in infancy contributes to the risk of immune and metabolic disease in later life, whereas loss of microbes in the elderly due to monotonous diets has been linked with unhealthy ageing and frailty. This should influence modern dietary advice regarding prevention and management of chronic non-communicable inflammatory and metabolic disorders, and will inform the design of infant and future food formula. The microbiota profile is also emerging as a biomarker to predict responsiveness to dietary interventions and promises to make personalised nutrition a reality. The microbiota transduces nutrient signals from the diet to the host. Diet regulates the composition of the microbiota. Many diet-derived microbial metabolites are beneficial but specific metabolites may be associated with the risk of disease and represent a source of biomarkers of metabolic responses in the host to dietary intake. Monotonous diets lead to a reduction in biodiversity of the microbiota. Loss of diversity of the microbiota is linked with risk of infections and inflammation. The microbiota is a plausible target for modifying or preventing the adverse effects of undernutrition and overnutrition. The microbiota can be used as a biomarker to predict responsiveness to specific dietary constituents, for example, fibre. Microbiome science is challenging traditional concepts of nutrition, creating new paradigms for dietary assessment and revealing new avenues of research for future foods. The most important lessons from microbial science are simple yet elegant; when we eat, we feed not only ourselves but also our microbes. Maintenance of a healthy microbiota requires a healthy diet, the requirements for which vary with the age of the host and with disease, and vertical transmission of the microbiota implies that expectant mothers are, in essence, eating for a new generation! These simple concepts have obvious implications for modern approaches to nutrition. Advances in understanding the composition and function of the indigenous microbiota continue apace, particularly since the introduction of molecular techniques to study microbial communities which were previously either uncharacterised or dismissed as being ‘unculturable’. The role of the microbiota in health and disease has undergone an upgrade in status from that of a ‘neglected organ’ to one of an ecosystem which transduces nutrient and other environmental signals to the host metabolism and homoeostasis.1–3 It is increasingly apparent that many aspects of traditional dietetics and nutritional science are becoming more nuanced, with deeper understanding derived from emerging microbiome science. Opportunities for translating microbiome science to clinical medicine and to new concepts of future foods are a realistic prospect. Comprehensive descriptions of the relationship between diet and the microbiota may be found in earlier reviews.2–8 Here, we present an overview of recent information of particular relevance to clinical practice and likely to have a transformative impact on modern approaches to nutritional assessment and on the design of future foods. Complexity and interconnectivity among diet-microbe-host interactions. Dietary fat stimulates release of bile acids into the upper GI tract from which they undergo enterohepatic circulation following progressive deconjugation and conversion of primary to secondary bile acids, which have direct and indirect modifying effects on the composition of the microbiota by modifying the expression and production of host-derived antimicrobial factors, such as regenerating islet-derived protein 3 gamma (RegIIIγ). 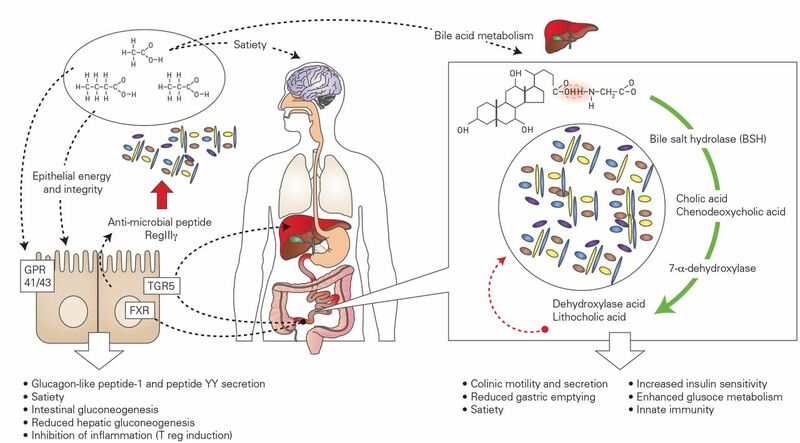 Bile acids signal through surface receptors (TGR5) and the nuclear receptor (FXR) have several downstream effects on GI motility and secretion, central signalling (satiety), metabolism and immunity. While bile salt hydrolase upregulates RegIIIγ, a high-fat diet may associate with reduced RegIIIγ, whereas some components of the microbiota, such as Akkermansia, upregulate RegIIIγ. These physiological events occur in the context of other diet-derived bacterial metabolites including short chain fatty acids (SCFA), which not only contribute to energy harvest for the host but also have pleiotropic effects on the brain–gut axis, neuroendocrine system and hepatic and peripheral tissue metabolism reviewed by Koh et al.19 SCFA signal via G-protein-coupled receptors; the activities shown are representative, not comprehensive. Red arrows: antimicrobial. FXR, farnesoid X receptor; TGR5, takeda G-protein-coupled receptor 5. In contrast, microbial metabolism of choline, a dietary phospholipid, glycine betaine (in certain legumes) or the amino acid, L-carnitine, which is abundant in red meat and other foods, may contribute to the risk of atherosclerosis by supporting increased microbial production of trimethylamine (TMA). After absorption, TMA undergoes hepatic oxidation to TMA N-oxide which is associated with accelerated atherosclerosis by various mechanisms including altered sterol and bile acid metabolism and macrophage activation.26 In addition to the bacterial role in producing TMA, other members of the microbiota (archeal methanogens) can dissimilate TMA,27 indicating a complex overall role for the microbiota in modulating this atherogenic metabolite. Several other bacterial constituents or metabolites have been linked with metabolic disease in the host but their relationship with dietary intake is less clear and their role in humans is uncertain. For example, lipopolysaccharide (LPS), a cell wall constituent of Gram-negative bacteria has been associated with a high-fat diet and linked with risk of inflammatory and obesity-related metabolic disorders including diabetes (metabolic endotoxemia).28 29 Increased plasma levels of LPS are associated with a high-fat diet, but whether this is a physiological response to fat with chylomicron-mediated absorption, or whether it is a proxy marker of mucosal barrier function and bacterial translocation, is unclear. HMOs are resistant to hydrolysis by gastric pH and digestive enzymes, undergo minimal absorption, and become substrates for the developing infant gut microbiota. They also protect against various pathogens by acting as biological decoys (antiadhesins) to offset invasiveness.33 HMOs are responsible, in part, for the timely presence and dominance of specific members of the genus Bifidobacterium in the gut microbiota of breast-fed infants.39–41 Consistent with this apparent HMO–Bifidobacterium link, it has been observed that reduced fucosylation of HMOs from mothers with inactive Se and/or Le genes impacts on the composition of bifidobacterial communities in the infant gut.42 43 Furthermore, it has become apparent that the genomes of these anaerobic microbes encode a broad spectrum of glycan-degrading enzymes, some of which represent species-specific glycosyl hydrolases that metabolise particular HMOs, such as fucosyl-lactose, sialyl-lactose and lacto-N-tetraose.44–47 Molecular analyses show that Bifidobacterium longum subsp infantis and Bifidobacterium bifidum are endowed with the widest range of HMO-degrading abilities, whereas other infant-associated bifidobacteria such as Bifidobacterium breve and B. longum subsp longum are much more limited in this regard.48 However, it has been shown for B. breve that this species cross feeds on the HMO-derived carbohydrates released by the extracellular enzymes of B. bifidum indicating that certain bifidobacterial species support each other, whereas others are more ‘egocentric’ in nature as they internalise the HMOs prior to hydrolysis.49 Intrinsic metabolic interactions among the various infant-associated bifidobacteria are incompletely understood, as are the exchanges between bifidobacteria and other gut microbiota components, and how these influence the developing host. The disparity in content of HMO or HMO-like content of human and bovine milk33 is one of the reasons for recommending exclusive breastfeeding in the first 6 months of neonatal life.53 Commercial milk formulae, traditionally based on bovine milk, are now supplemented with specific carbohydrates, such as galacto-oligosaccharides to replicate some of the HMO-associated functionalities.54 55 Large-scale production of relatively simple HMOs, such as sialyl-lactose, fucosyllactose and Lacto-N-(neo)tetraose, will facilitate the development of next generation, ‘humanised’ milk with added or enhanced functionality.56 57 As alluded in the next section below, the benefit of dietary supplementation with such an oligosaccharide has been demonstrated in models of infant undernutrition. Bacterial taxa which might promote weight gain or limit the activity of the undernutrition-related microbiota have been identified prompting speculation that microbial manipulation might help shift metabolism away from energy extraction by amino acid breakdown and towards growth and building lean body mass.60 In the absence of a microbiota, chronic undernutrition is associated with resistance to growth hormone, whereas the microbiota permits postnatal growth by conferring sensitivity to growth hormone with increased insulin-like growth factor activity in peripheral tissues. Lactobacillus plantarum mimics these effects of the microbiota in a strain-dependent manner. This has obvious preventive and therapeutic implications but the results cannot be extrapolated to all lactobacilli.61 However, microbiota-dependent growth can also been stimulated by HMOs from breast milk or by artificial supplementation with human sialylated milk oligosaccharides.62 (Figure 2). The undernourished microbiota. 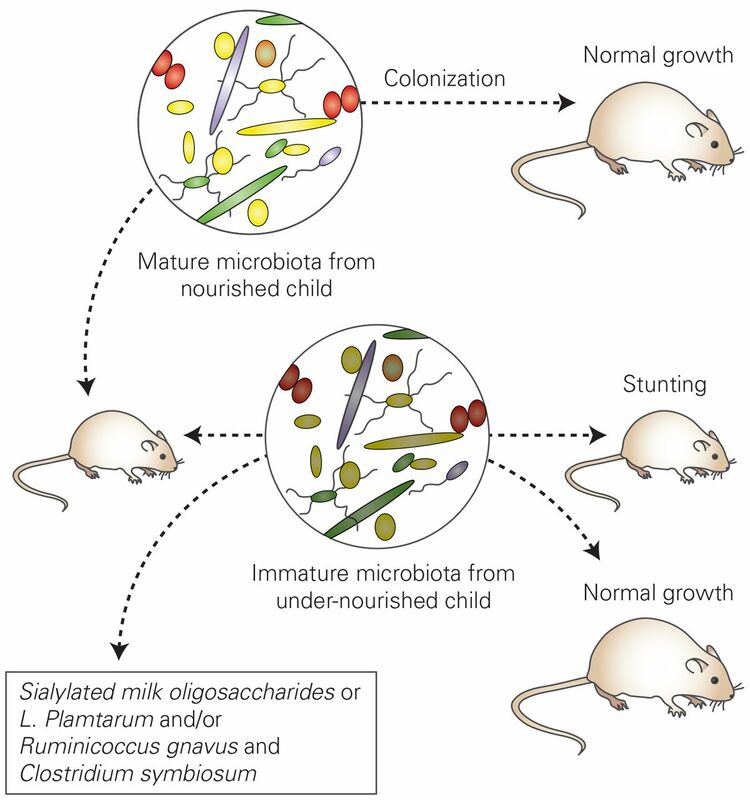 Colonisation of young mice with microbiota from healthy children leads to normal growth even if fed a nutrient deficient diet, whereas mice colonised by microbiota from a malnourished child exhibits stunting of growth. However, normal growth can be achieved by supplementation of the microbiota with specific microbial species at the time of initial colonisation or by dietary supplementation with sialylated milk oligosaccharides. Microbiota in overnutrition. Schematic representation of the use of experimental ‘humanised’ mice (germ-free animals colonised with human microbiota from donors of various phenotypes, obese (A) and lean (B)), to demonstrate the potential impact of the microbiota on weight and metabolism of the host. Murine-to-murine transfers demonstrate the same effect and permit dietary manipulation. 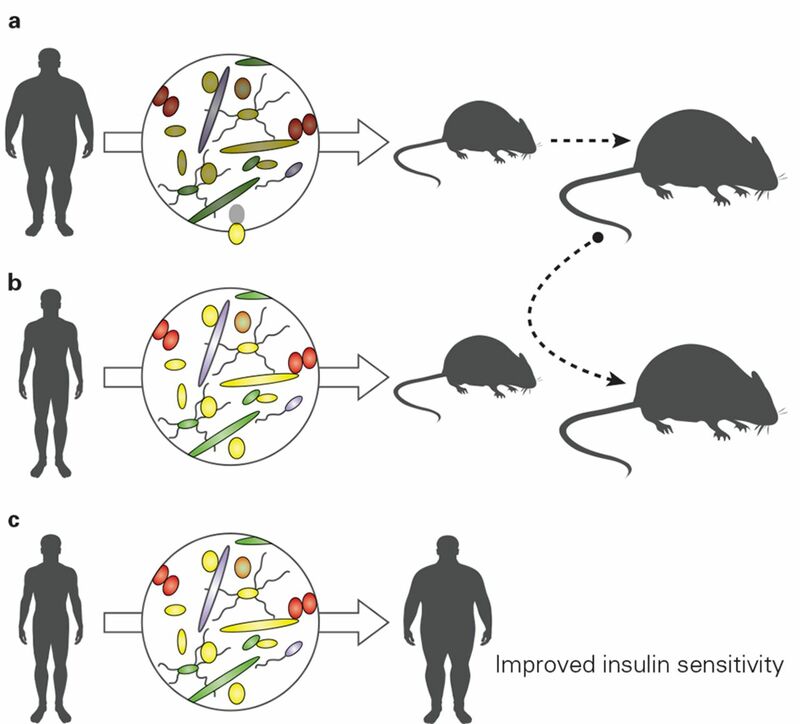 Human-to-human faecal microbial transplantation has also demonstrated the beneficial influence of a microbiota from a lean donor with improved insulin sensitivity in obese recipients (C). FMT, faecal microbial transplantation. Clinical dietary assessments have traditionally focused on quantity and quality of nutrient intake with little attention to dietary diversity. However, the microbiota varies with age, and the impact of diet is likely to be most significant at the extremes of life. In a large study of the elderly in different residential settings ranging from community dwelling to long stay institutional care, collapse of microbial diversity was associated with a shift toward a monotonous diet. More importantly, the loss of microbial diversity was linked with increased markers of inflammation and frailty. Although correlation should not be transmuted to causation, the directionality of the changes suggested causation with dietary change preceding the loss of microbial diversity and the severity of the latter increasing with duration of exposure to the monotonous diet.78 (Figure 4). Diversity as staple, not simply spice of life. 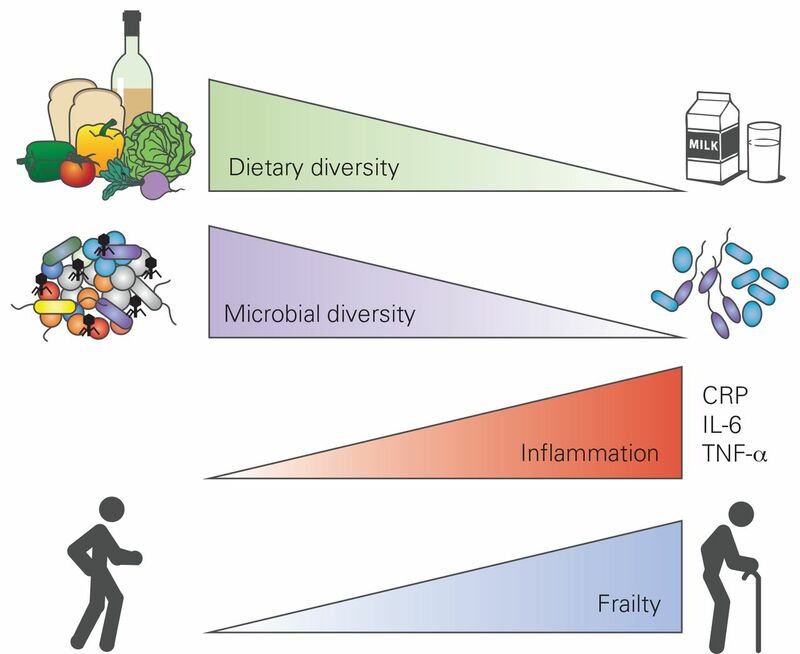 Diversity of dietary intake correlates with microbial diversity in the gut which is linked with inflammatory tone and risk of frailty in the elderly. Thus, a monotonous or restricted diet (although with adequate calories and essential nutrients) which is often liquidised and convenient in the case of the elderly is linked with loss of microbial diversity, and perhaps more importantly, with loss of key microbial functions and a risk of a gain in pathobionts, including susceptibility to overgrowth of Clostridium difficile. CRP, C-reactive protein; IL-6, interleukin-6; TNF-α, tumour necrosis factor-α. To model the impact of reduced dietary diversity on the microbiota, humanised mice were deployed in which human faecal microbiota was introduced into germ-free mice which were then fed a low-fibre diet. This resulted in a progressive loss of microbial diversity which could be at least partially restored with reintroduction of dietary fibre. However, once the reduced microbial diversity with missing taxa were transmitted to subsequent generations, the reintroduction of fibre was insufficient to reverse the loss.79 These data imply that not only does dietary diversity maintain microbial diversity but an individual's diet today influences the microbiota of future generations—a concept that needs to be addressed during antenatal education and maternal nutrition. Profiling the composition of the human microbiota is still limited by the resolving power of many molecular strategies which seldom accurately go beyond the genus level for many microbiota members. Nevertheless, the potential to identify personal microbiomes using metagenomic codes has been successfully validated.85 The demonstration that dietary advice can be personalised using the microbiome as a biomarker promises new diagnostic approaches to the nutritional assessment of humans. Profiling the microbiota as a biomarker of responsiveness to diet has been applied to personalised nutrition in an elegant study of interpersonal variability of postprandial glucose responses to identical meals.86 High interindividual variability to the same diet undermines the value of universal dietary recommendations. Therefore, a machine-learning algorithm incorporating microbiota profiling with relevant physical, lifestyle, metabolic and nutritional parameters was devised to accurately predict individual human responses to meals. This predictive strategy was then used to personalise dietary intervention and modify postprandial glucose responses. The same investigators have also deployed a machine-learning algorithm using microbiota composition alone to predict risk of diet-induced obesity and weight regain after dieting in mice.86 The potential to adapt such strategies to other disorders including chronic inflammatory and cardiovascular disorders is provocative. Metabolic biomarkers including blood lipids have long been used to assess risk of cardiovascular disease but recently the gut microbiome has been shown to contribute to interindividual variation in blood lipids.87 In a robust study of almost 900 human volunteers, the microbiota accounted, in part, for much of variability in body mass index and blood lipids, independent of host gender, age and genetics. The microbiota influence was observed at the level of triglycerides and high-density lipoproteins, but not low-density lipoproteins or total cholesterol. Incorporating microbiota compositional data into a novel risk model outperformed the risk model without microbiome. Furthermore, broad microbiotal diversity appeared to favour cardiovascular and metabolic health, and associations with changes in specific bacterial taxa were identified. Health maintenance and fitness are no longer solely about human physiology. Maintenance of a healthy microbiome is inseparable from host health. Strategies for therapeutic manipulation of the microbiome in different metabolic, inflammatory or neoplastic disorders may require specific design and tailored to individual susceptibility. However, for most individuals, general principles by which one may mind one's microbes have emerged. Birth by vaginal delivery, breast-fed by a well-nourished mother and avoidance of antibiotics in infancy are a good start. Healthy lifestyle factors under one's control and within the scope of common sense include: a diversified diet, limited use of processed foods, avoidance of prolonged restricted diets, consumption of adequate dietary fibre, exercise95 and moderation in all respects are all supported by modern microbiome science. We thank all investigators who have made significant contributions to this field including those whose work we were unable to cite because of space limitations and for which we regret.
. Detection of four human milk groups with respect to Lewis-blood-group-dependent oligosaccharides by serologic and chromatographic analysis. Adv Exp Med Biol 2001;501:299–306. Contributors All authors contributed to the content of the manuscript. Competing interests FS is a co-founder, shareholder in Atlantia Food Clinical Trials, 4D Pharma Cork, Alimentary Health. He is the director of the APC Microbiome Institute, a research centre funded in part by Science Foundation Ireland (APC/SFI/12/RC/2273) and which is/has recently been in receipt of research grants from Abvie, Alimentary Health, Cremo, Danone, Janssen, Friesland Campina, General Mills, Kerry, MeadJohnson, Nutricia, 4D Pharma and Second Genome, and Sigmoid Pharma.